So we decided to go skiing in Slovakia. We chose Jasná Nízke Tatry as our skiing destination. This resort's situated on Chopok mountain (location here) which reaches 2024 metres and forms part of Nízke Tatry (Low Tatra mountains). We were in a group of 4. It was 1-week holidays. We stayed in Pavčiná Lehota - a nice and peaceful village situated in Demänovská Dolina. Location was great - our place was only about 10 kilometres from Chopok. The standard of room's another story. Well, we wanted something cheap, so we got something cheap. I think the rooms may have remembered late 80s but, at least, they were spacious. On first day, to warm up and avoid crowded ski runs (it was Sunday) we decided to hike to Chopok peak. And we didn't make it. Anyway, let's get back to skiing. We decided to ski every second day so that our muscles had time to regenerate. There are many ski runs on Chopok. Some are very steep, some are mild and some can even get you in the middle of forest - there are several freeride zones. 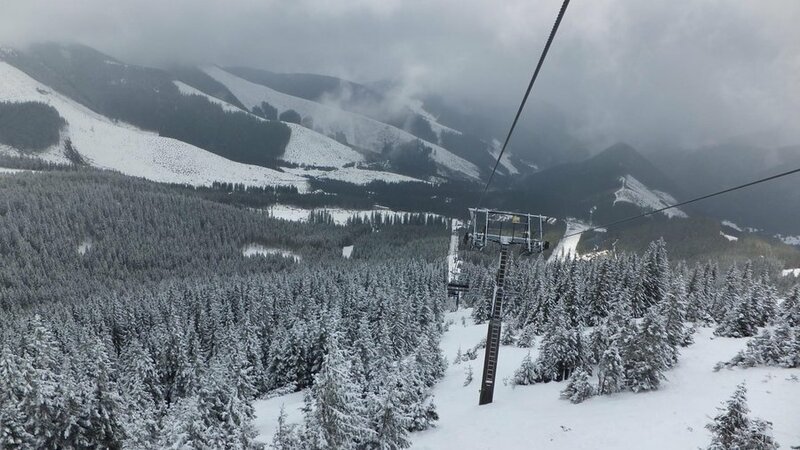 Jasná resort is actually famous for its many off-piste ski runs - it's the biggest off-piste ski resort in Slovakia! The important thing to mention is that Jasná Nízke Tatry resort offers the chance of night skiing (from 6 PM to 9 PM). In general, ski resort on Chopok is modern and offers comfortable and efficient ski-lifts. There is even one small-gauge train! I'd say Jasná Nízke Tatry is definitely on a par with other, more popular skiing destinations in Western Europe. North (Chopok Sever) - the main part with artificial snow system. South (Chopok Juh) - here's only natural snow, lots of freeride zones and definitely much less people. The infrastructure is well-developed and we liked the fact that there are many restaurants in Jasná resort. Got cold or hungry? No problem, there's a nice eating place just few minutes of skiing away. The highest point where skiers can get is 2004 metres. Of course, we decided to give it a try, not paying attention to the poor weather. And we got what we expected - what a dreadful weather there was! I'll never ever forget extremely strong wind smacking me in the face. And the fog was so dense that I wasn't able to see a thing. I got scared that I'd loose sight of my friends, and most importantly, of the ski run! To make matters worse, the piste was ice-covered. Fortunately, not all days were cloudy and windy. When the weather is sunny, the views from Jasná ski resort will take your breath away! Low Tatras are very picturesque mountains and the landscape rewards every effort. For me, it is especially the views which make skiing in Slovak Tatra mountains so memorable. In fact, Chopok mountain isn't only known for the ski resort. It's also popular summer destination and one of the best hikes in Slovakia. The other day we decided to get some rest in Tatralandia - big water park in Liptovský Mikuláš. It was fun. There are lots of water slides, jacuzzis, pools with hot mineral water, etc. The water's pumped from deep grounds and is rich in nutrients - my skin got really smooth afterwards! The only drawback of this place is that it was rather crowded. Fortunately, its enormous size allows people to disperse (at least to some extent). We visited also Demänovská jaskyňa Slobody (Demanovska Cave of Liberty). It was very beautiful and quite spacious. We wanted to see Demänovská ľadová jaskyňa (Demanovska Ice Cave) too but it's inaccessible in winter time - it gets completely frozen. Jasná ski resort together with Demanovska valley is the best option for skiing holidays in Slovakia. Modern infrastructure, beautiful landscape and lots of other tourist attractions in the area make Jasná Chopok resort perfect destination for fun seekers and outdoor enthusiasts. And you, which European ski resort would you recommend?